GLHC 2nds with Helen Mather finishing near post. Garstang 2nds at home, took on Pendle 3rds looking to take revenge for an early season defeat by the odd goal. Garstang started well at a cracking pace with quality passing and good teamwork and after only three minutes an excellent sequence of passes ended with the mighty Fi Dundas neatly posting the ball past an outflanked Pendle Keeper; 1 – 0 to Garstang. Play settled down with Pendle coming back hard particularly on their left wing where a speedy and talented young player was making progress but only as far as a steady and determined Ellie Harrison at right back. This was Ellie’s first game after a facial injury and she was out to prove that she was not a feared. After 11 minutes Garstang won a penalty corner and a slip left to Rachel Roe was followed by a mighty thump as Rachel hit the backboard with a mini Exocet missile that gave the keeper no chance; 2 – 0 to Garstang. Caroline Hampson (Mum of Georgie & Jemma) just missed a ball on the post coming very close to scoring and in the last few minutes of the half Garstang poured on the pressure get their third goal to close the game out. Pendle resolutely defended a series of penalty corners. One shot from Georgie Hampson slid agonisingly close just outside the post and the score remained 2 – 0 at the break. Pendle started the second half in determined mood and had Garstang pinned in their half for ten minutes. The Garstang defence of Zoe Mather in goal, the two young Ellies (Harrison and Moss), Gemma Livesey and Jemma Hampson led by Georgie Hampson stood firm and showed why Garstang have the best defensive record in the Division. 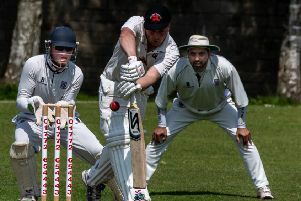 However the old problem of failing to clear the ball came back and the Garstang supporters were anxious that the team’s good work could be undone. Garstang at last worked their way back and after 14 minutes won a penalty corner. Rachel Roe’s first shot was well saved by the Pendle Keeper but Julie Nightingale trapped the ball and fed it left to Helen Mather on the post who calmly put the ball in the net; 3 – 0 and the Garstang supporters were able to discard their oxygen masks. Garstang’s powerful senior players Julie Nightingale and Wendy Howarth with Captain Helen Mather started to hold the ball well in the Pendle half and the Pendle Keeper made some good saves including a great block followed by a full stretch goal saving reach across. The backs started to rampage forward and Pendle were held in a firm grip. Olivia Mason came agonisingly close on the post. With three minutes to go Helen Mather put the ball in the net after a good series of passes culminating in a slip left by Julie. The goal was correctly disallowed because of secondary obstruction by a Garstang player and Garstang finished 3 – 0 as well-deserved winners; cementing their second place in the Division as their rivals lost to the currently dominant top team. This was a much better team performance than the week before but Garstang will need to sustain their efforts to win promotion. Pendle never slackened and were always a potent threat to Garstang’s young defence. The team voted Ellie Harrison ‘man of the match’ for her brave, bold play on return from a nasty injury.